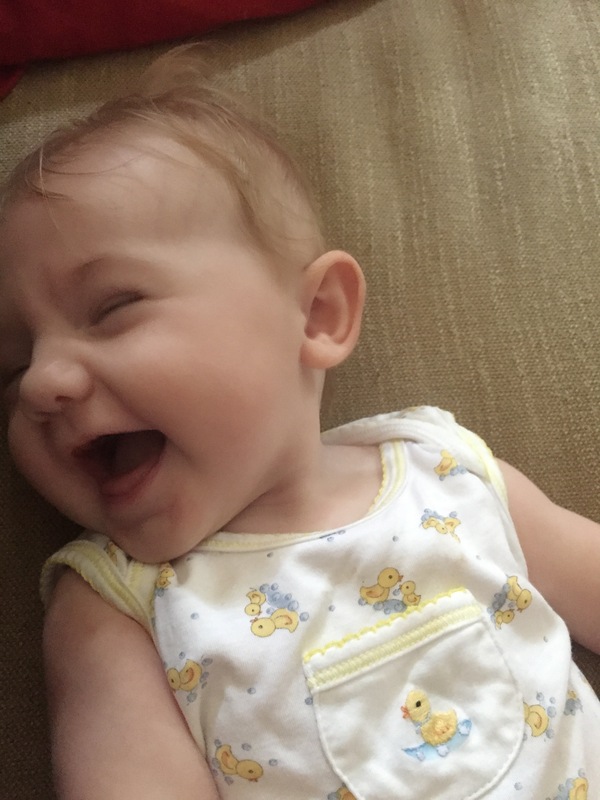 It has been over four months since I had my second child. People say time flies when you have children, but you don’t realize how fast until you look at pictures and literally watch them change day by day. Life is starting to become a little more “normal”. I am back to work – at least as much as I will be for a few more years. I feel like we are getting on a “routine”. I now feel pretty comfortable leaving my kids with a sitter to get out and about when I need to. Some nights are better than others. In just a few months we have come a long ways. 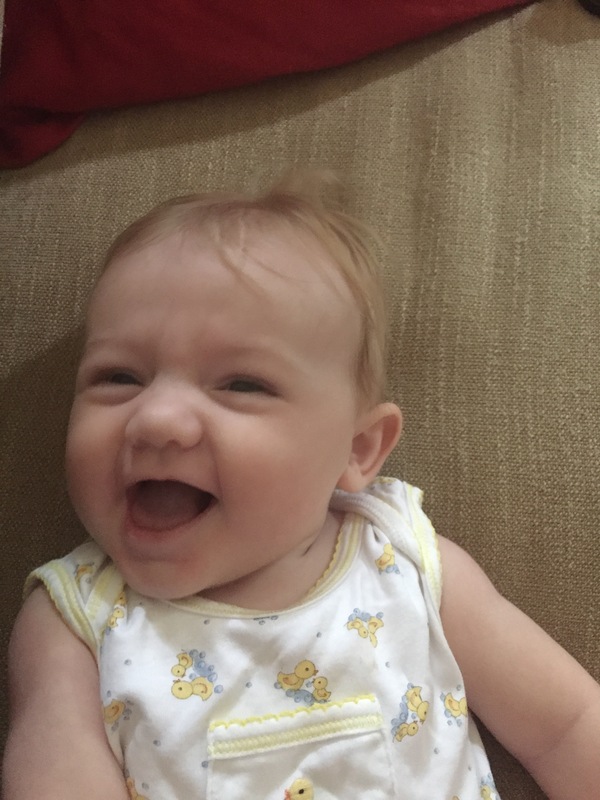 Just three months ago, our youngest could hardly sleep two hours straight without me holding her in my arms all night. 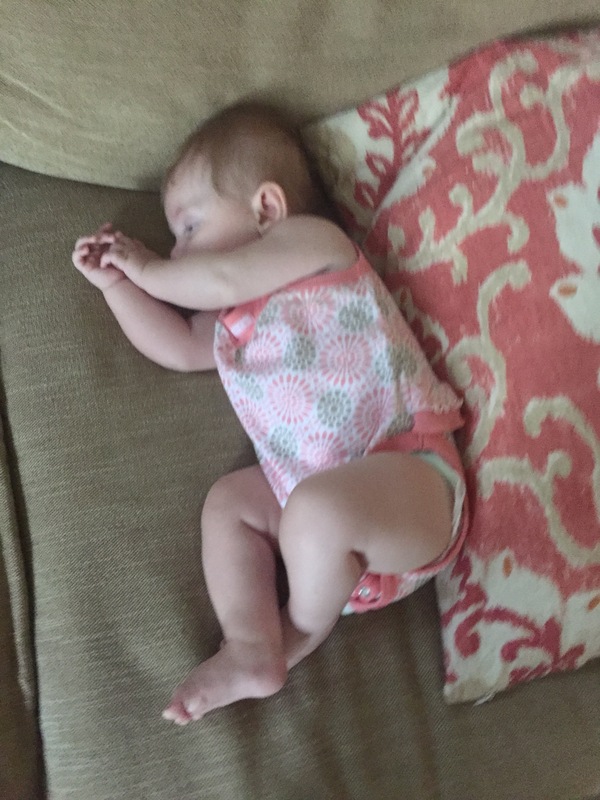 She is now happily sleeping in her crib for stretches lasting as long as 7-8 hours. She has slept through the night two times. However, most nights, one of us is getting up around 3:30 AM – 4:30 AM to feed her. Depending on the time, we will either stay up (and go work out) or we will try to grab an extra hour of sleep. She goes back to sleep almost immediately after eating. 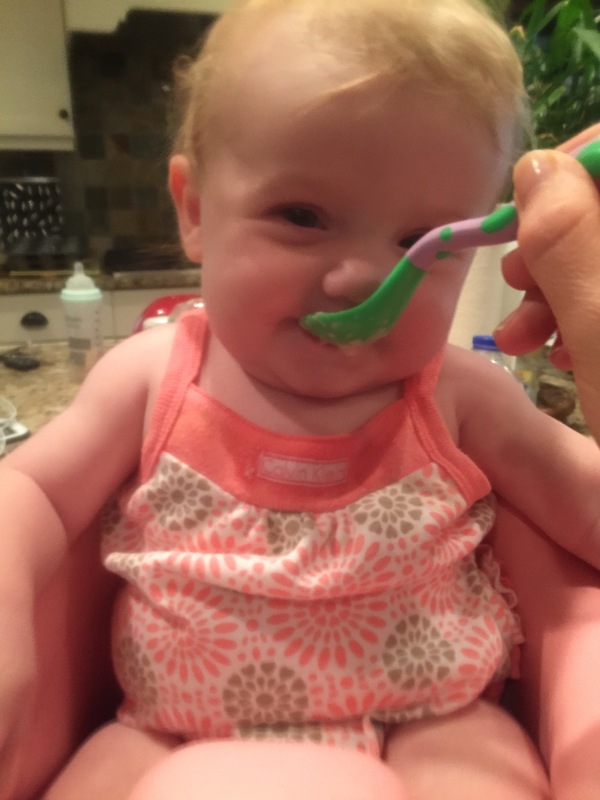 We started solids! So far we have tried rice cereal, bananas and apples. Typically I give her solids in the evening before a pre-bed bottle. However, based on the amount that she is eating, I will need to start feeding her food in the mornings too. She is really getting good at holding her head up. 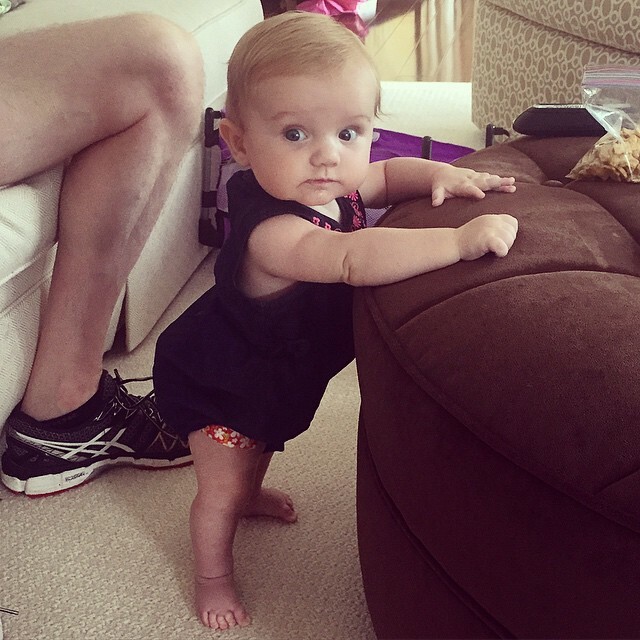 She LOVES to stand. She will lock those legs out and not let you bend them. She will let you know if she wants to be UP! She just recently let us prop her against things so she can hold herself up. This is such a big change from just a few weeks ago when she was on the ground. See picture below. She loves “Papa”. 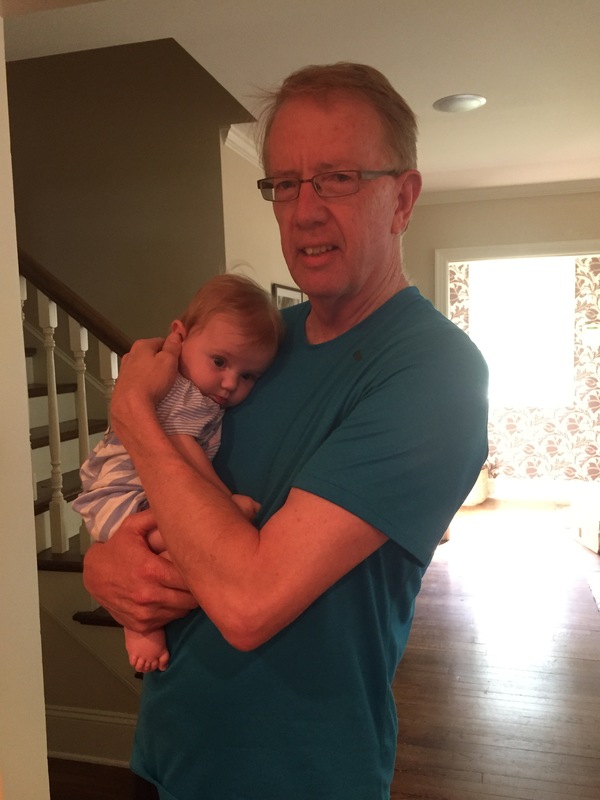 My dad has been in Charlotte a lot more after the birth of my second daughter as compared to my first. We stop by to see him a lot. It seems like a day is not a day until we see Papa. Somehow he always gets her to “close the windows” (i.e. shut her eyes to fall asleep). She is babbling a lot. 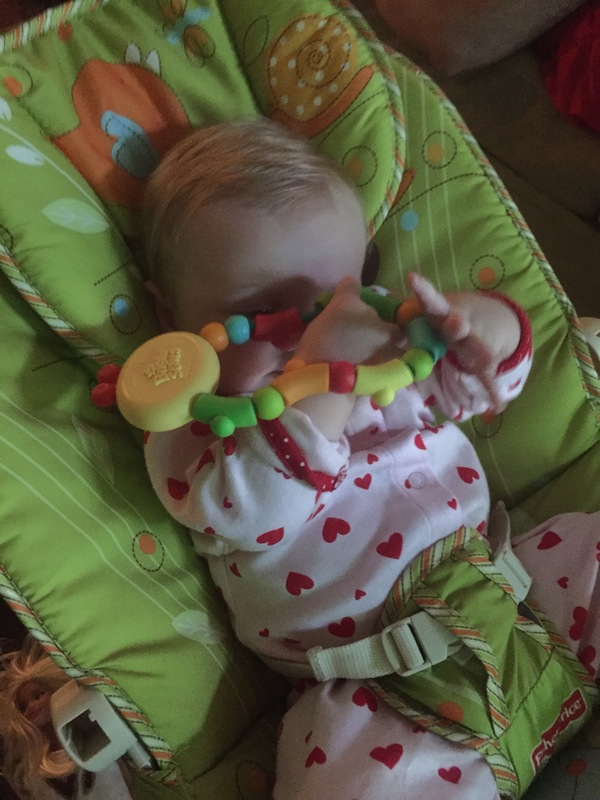 At the most random times, she just starts talking, making raspberries, blowing bubbles or squealing in a high pitched tone. She absolutely love to smile. I didn’t know someone could smile so big. It’s infectious. 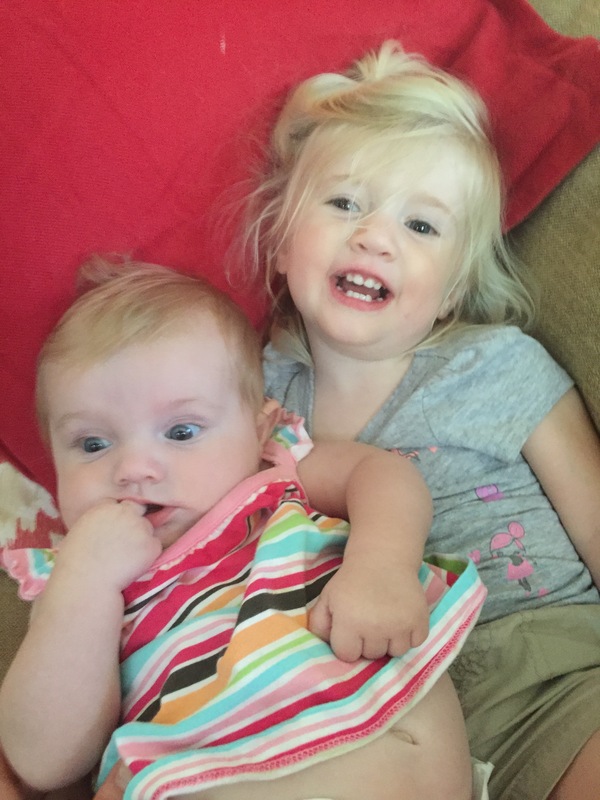 She loves her sister as much as her sister loves her. They lay on the floor and look into each other’s eyes. They find comfort in each other. They get sad when the other one is not around. They are attached. She is grabbing for toys. Putting them in her mouth. Learning how to play. She is quiet, yet determined. She is easy, but has her moments. She goes with the flow. 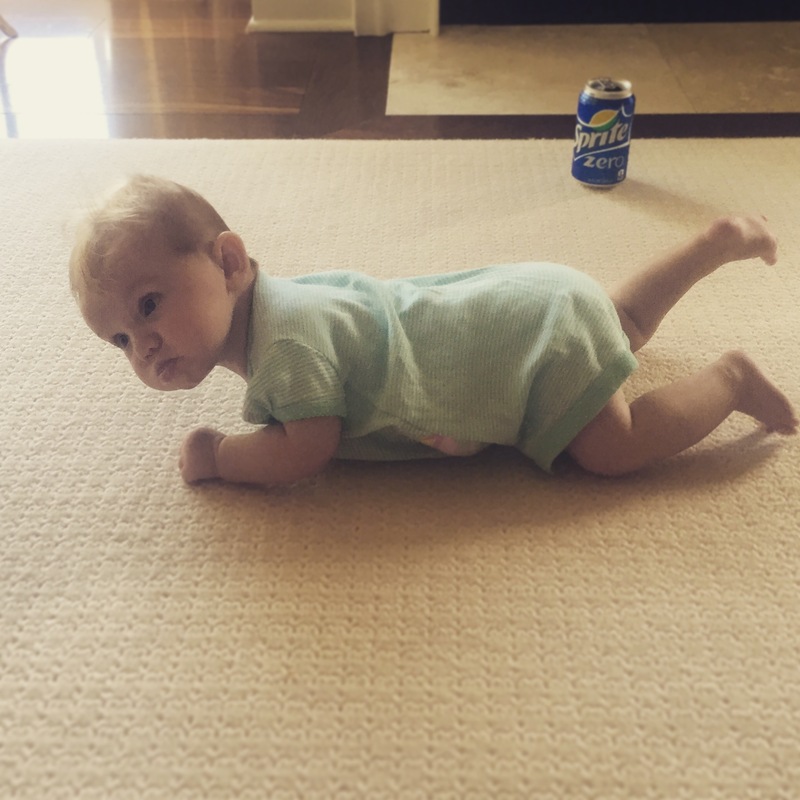 She is molding into the family in her own way. We are so lucky to have her. As our longtime sitter would say, she is our “Peanuthead”. 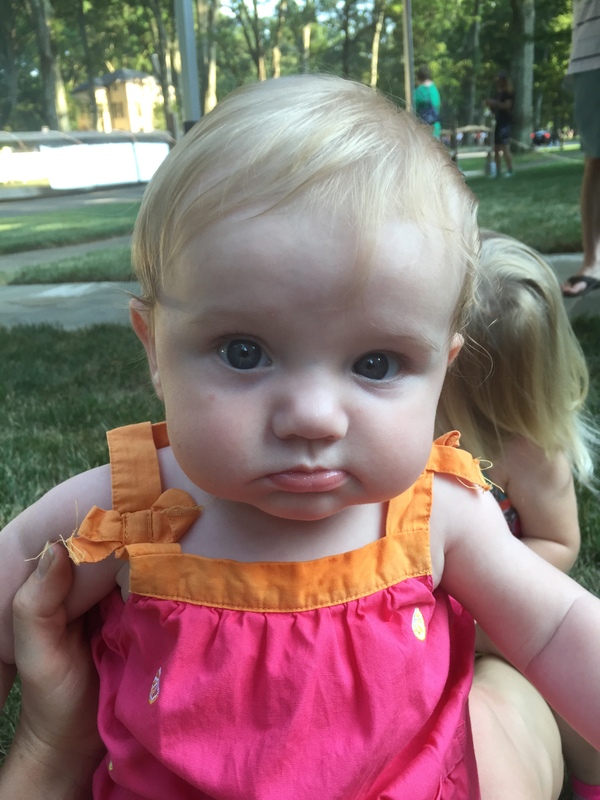 This entry was posted in babies and tagged baby four month on July 30, 2015 by flyjenduf. Oh hey! Did you miss my @WeLoveCLT Instagram takeover? Maybe you don’t have Instagram? Or maybe you just want more details on some of the things that I posted about? I’m here to fill you in. First and foremost, when I decided to sign up to takeover the account, I had an idea of some of the events, places and food that I wanted to share. The @WeLoveCLT Instagram account is entirely a takeover account. Those interested in participating must apply and be approved by management. There are rules surrounding posting guidelines. I love it. It is such a great way to see Charlotte through the eyes of completely different individuals. It’s growing. I hope the growth continues! 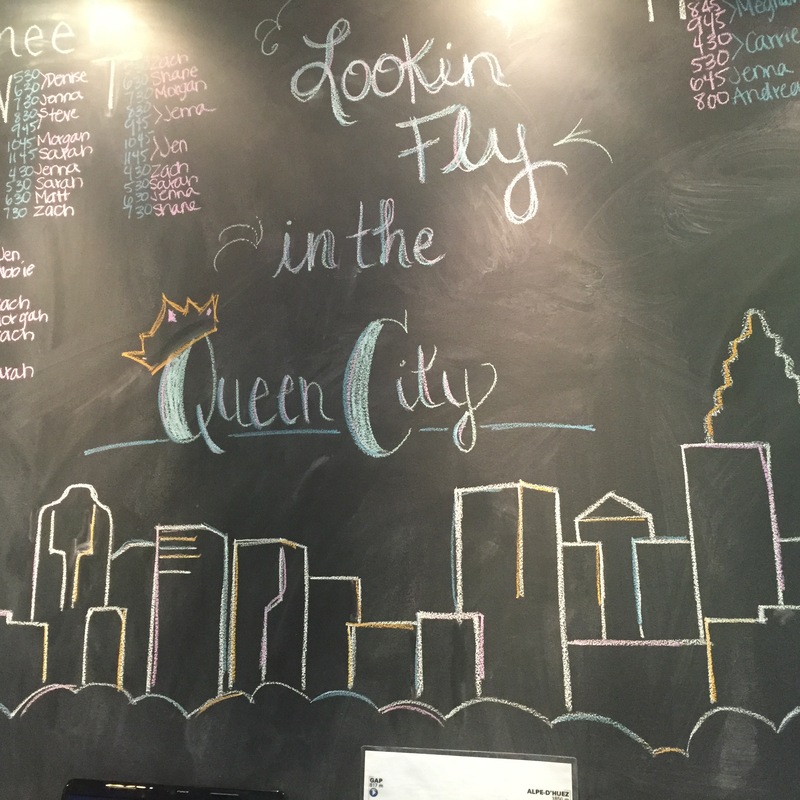 Flywheel Charlotte – I started my takeover with an introductory video outside Flywheel Charlotte. Bright and early. Saturday is a big workout day for fitness junkies in Charlotte. The weekend is typically the best time to get a long workout in simply because of time. While most people have the weekend off, I am actually working both days! That said, if I want to get my own workout in, I have to do it super early or later in the day (after training people). I lose motivation as the day goes on. 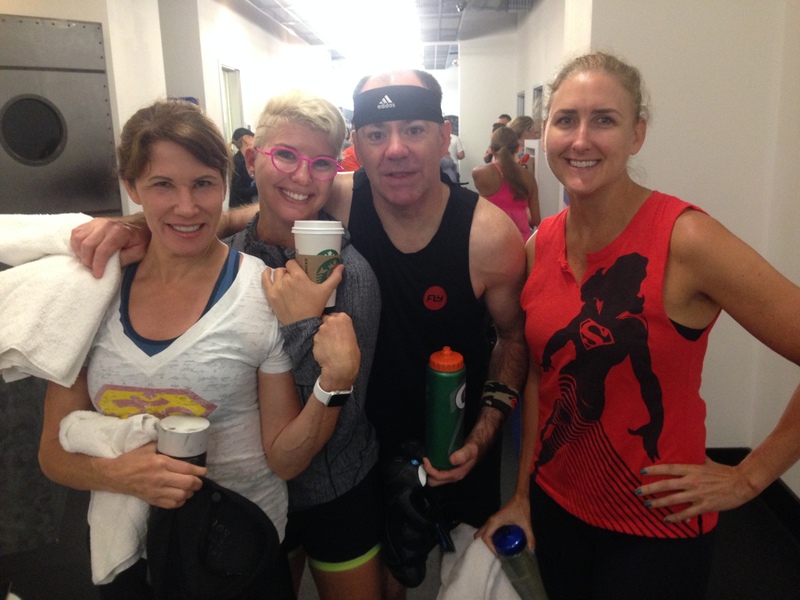 As such, I jumped in the first class at Flywheel Charlotte Saturday morning – 6:15 AM. Yep, early. I’m up early anyways. I have a four month old and a twenty-one month old. That’s life. May as well get my workout over with. On Saturday mornings, the studio has an incredible vibe. Classes are full. People are revved. It’s an exciting atmosphere to be a part of. 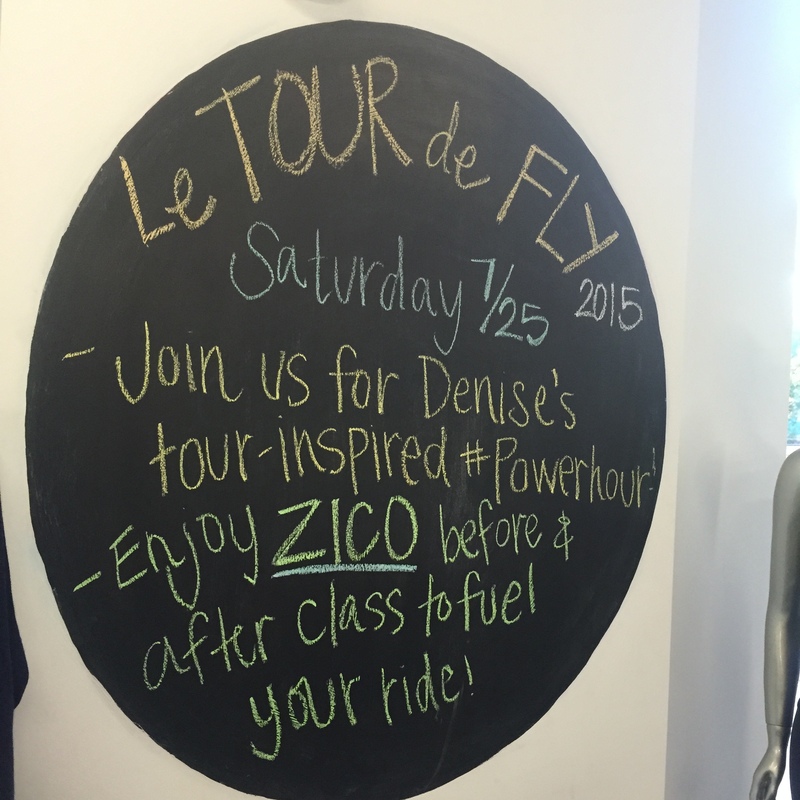 It just so happened that the day I was riding Denise Duffy was also teaching a Tour De France power hour ride. I couldn’t stick around for it, but I did see her getting set up for it. Like I said, Saturday has a different vibe. 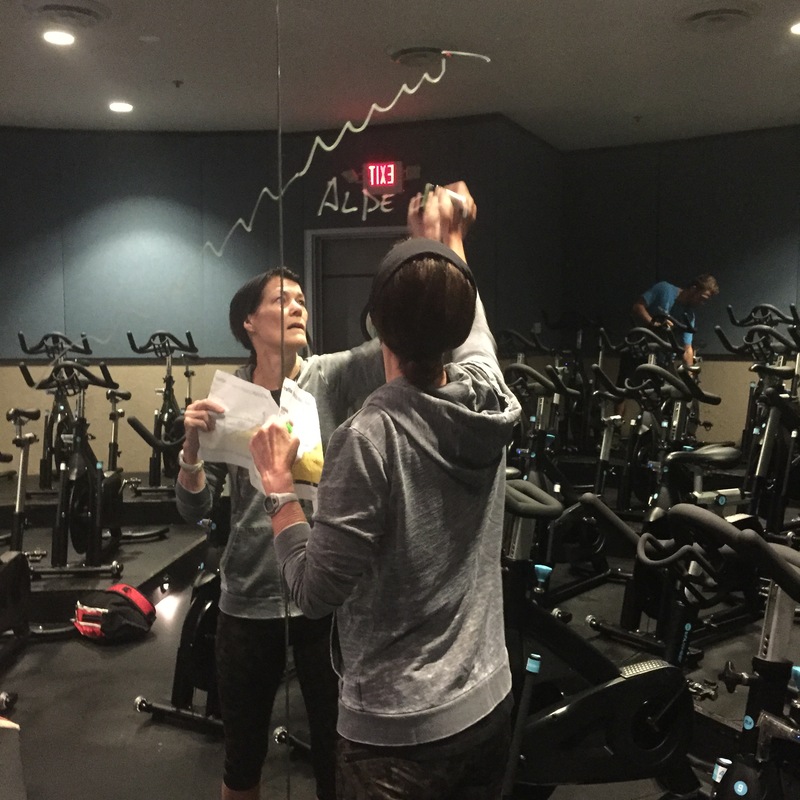 For all of her power hours, she draws the profile of the ride on the mirror that covers the wall behind her. You know what you are in for. Look at that hill. Yikes! Riders gathered in the hallway anticipating the brutal test that laid ahead of them. There are several things that make these rides so incredible. First, it’s cardio that the majority of people can do. It’s low impact. I rode until the day I delivered both children. Second, it’s dark. You don’t have to worry about what you look like (or what other people think you look like). Get in your zone and move on. Finally, it’s super effective, efficient and not boring. 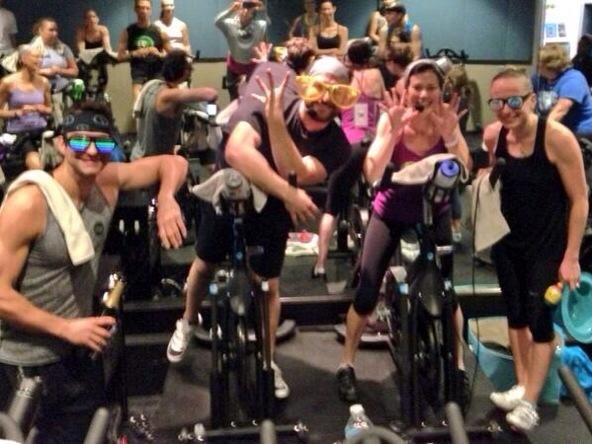 The instructors are hyped, the music is incredible, and you won’t find very many other workouts that will burn that many calories in such a short amount of time. 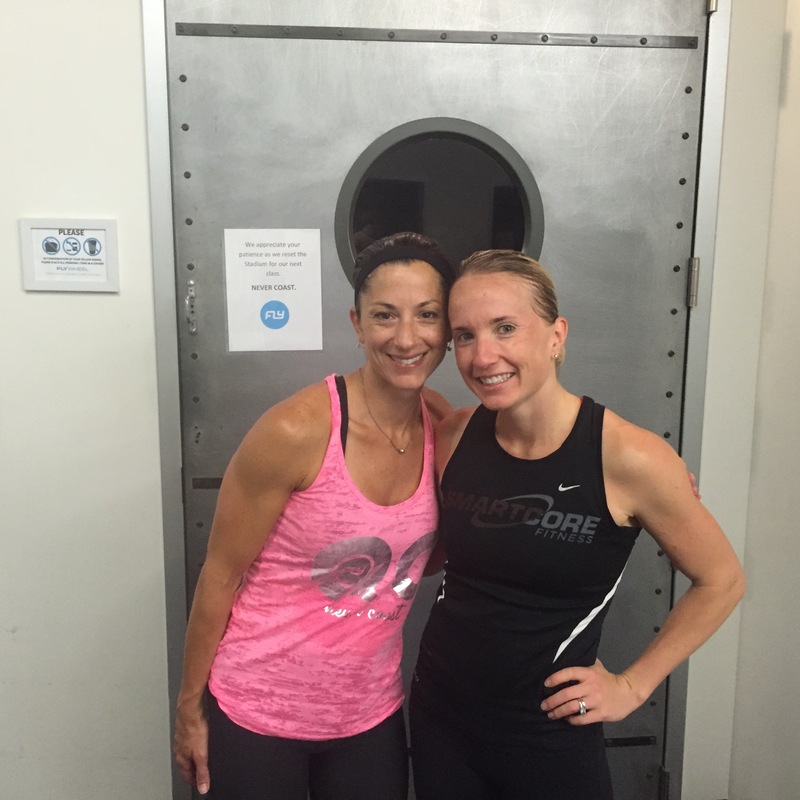 SmartCore Fitness – Following my own workout, I headed to SmartCore Fitness for the fun part – running other people through their own workout. I am now leading regular bootcamps every Saturday at 10 AM. It just so happened that the trainer that leads the 8:30 AM bootcamp was on vacation this week. That left me leading back to back sessions. Workout was on the wall. This is shorthand for many exercises. It really isn’t as easy (or hard) as it sounds. These key words were there in case participants needed to review what they had to do next. 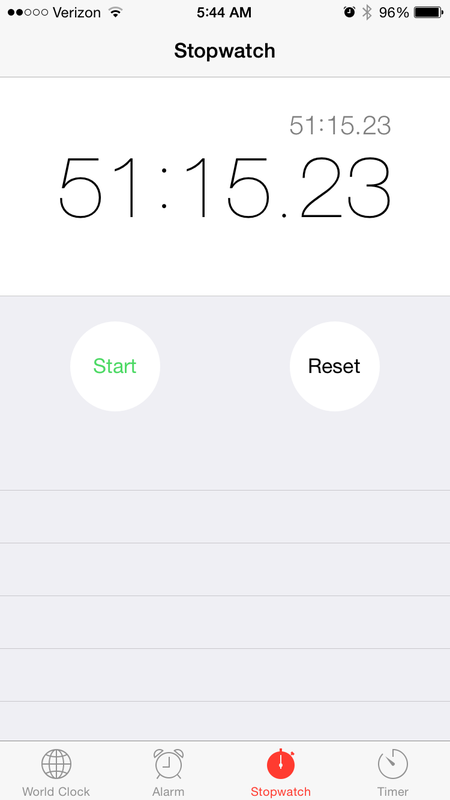 Each workout is approximately 60 minutes. 4 circuits of 4 exercises completed twice. Each individual has their own designated space that he or she can perform the exercises at their own speed. This is not a competition but rather an effective way to complete complex moves with an added cardio element. It’s organized such that anything can be modified for various injuries or preexisting conditions. I love it. I am a believer in it. I do it myself. 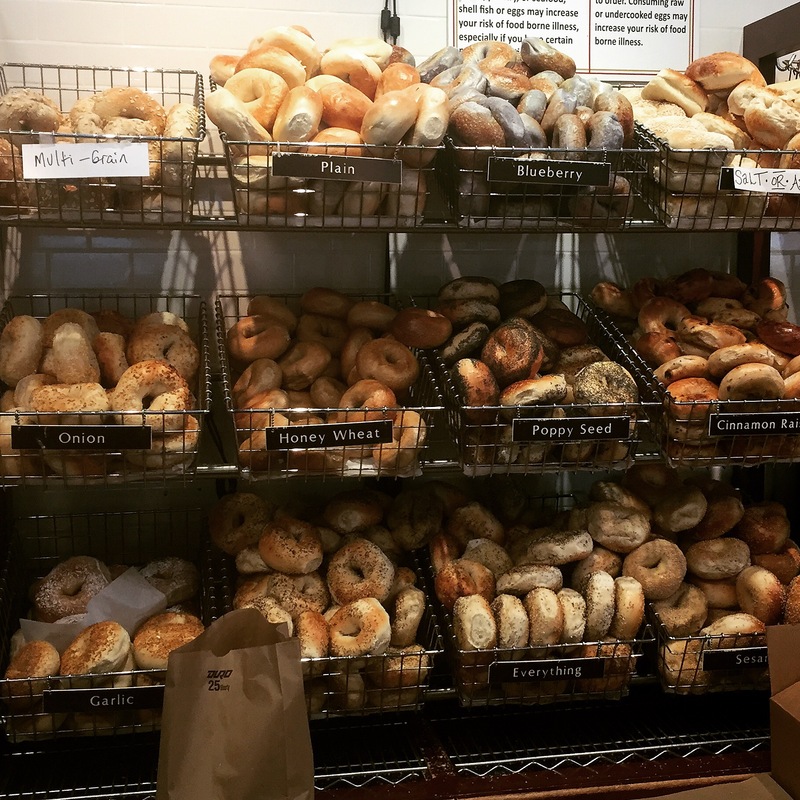 Poppy’s Bagels – Insert big break in Insta posting. I didn’t touch my phone while I was at SmartCore. I picked it back up after my final client left and the training facility was cleaned up. I’m not going to lie, I was starving. I needed something substantial. Something filling. Thank you Poppy’s Bagels. If you haven’t been here, you are missing out. My husband and I discovered this diamond in the rough several years ago. Since then, the small company has started delivering their bagels to all of our local grocery stores. Awesome. If I don’t want to make an extra trip (or stand in line), I can always just swing by Harris Teeter. $1 a bagel. I can work with that. 24 Hours of Booty – Once I got some food and showered, I was ready to take on the day with the family. Listen, everything that happened prior to Poppy’s happened before 12:30 PM. I was busy. We live within walking distance of the coveted “Booty Loop”. 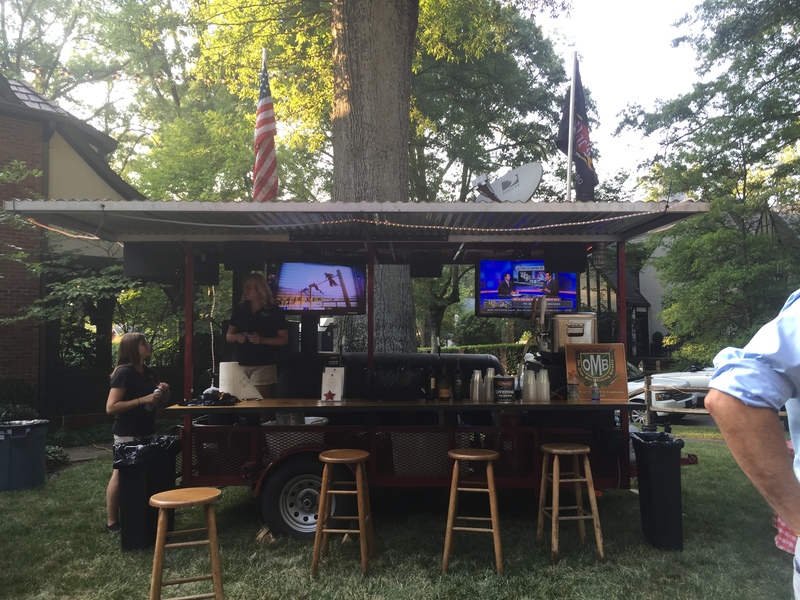 We spent a lot of time cruising the various tailgates both Friday and Saturday night. Prior to Saturday, we spent a better part of Friday evening catching the kick off National Anthem, riders taking off from the starting line and enjoying some good barbecue. 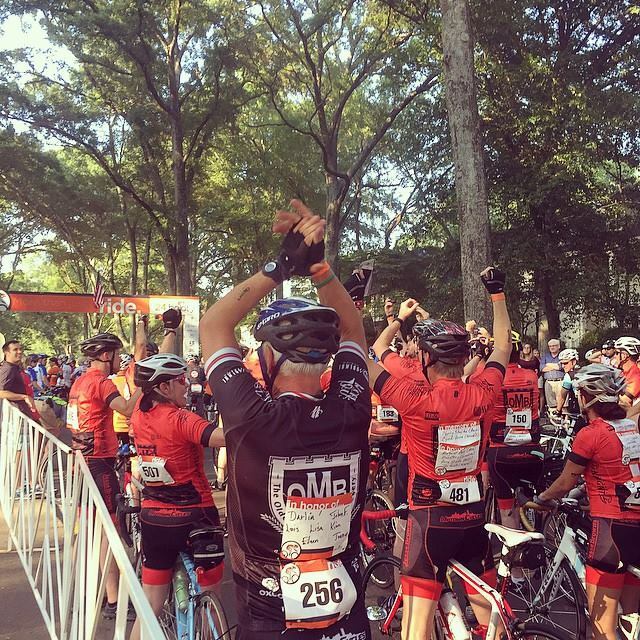 The ride is for a great cause – raising money for cancer-fighting programs. The camaraderie and atmosphere is incredible. Suburbia turns into a mini city for just one night. There is a buzz in the neighborhood. 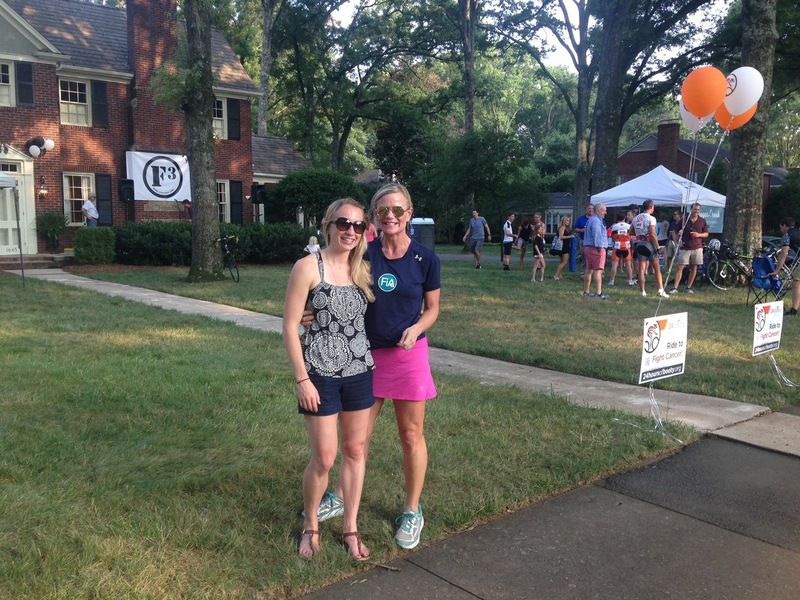 While we were out and about, I ran into FiA (Females in Action) founder, Amy Peacock. See picture below. Coincidentally, it just so happened that we were standing outside of the F3 fueling station. If you didn’t know, FiA was started as the female version of F3. I met Amy (nickname ChiaPet) over a year ago when I posted at one of my first workouts. See my review. I love these groups because first and foremost they are free. However, I have built an incredible network of friends while grueling through peer led bootcamps and runs as early as 5:15 AM some mornings. Selwyn Pub/Reid’s – It didn’t take long for my husband and I to get hungry again. 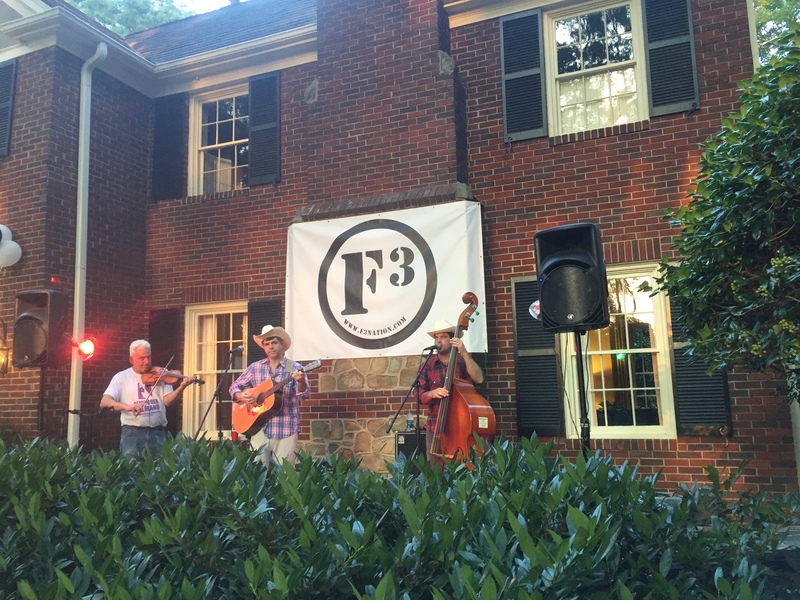 My husband also put in a hard workout with F3 earlier in the day. We had enough barbecue Friday night, so we opted to swing by Selwyn Pub for a drink before stopping at Reid’s for dinner. Selwyn Pub is quite possibly one of my favorite places to enjoy a drink and food. 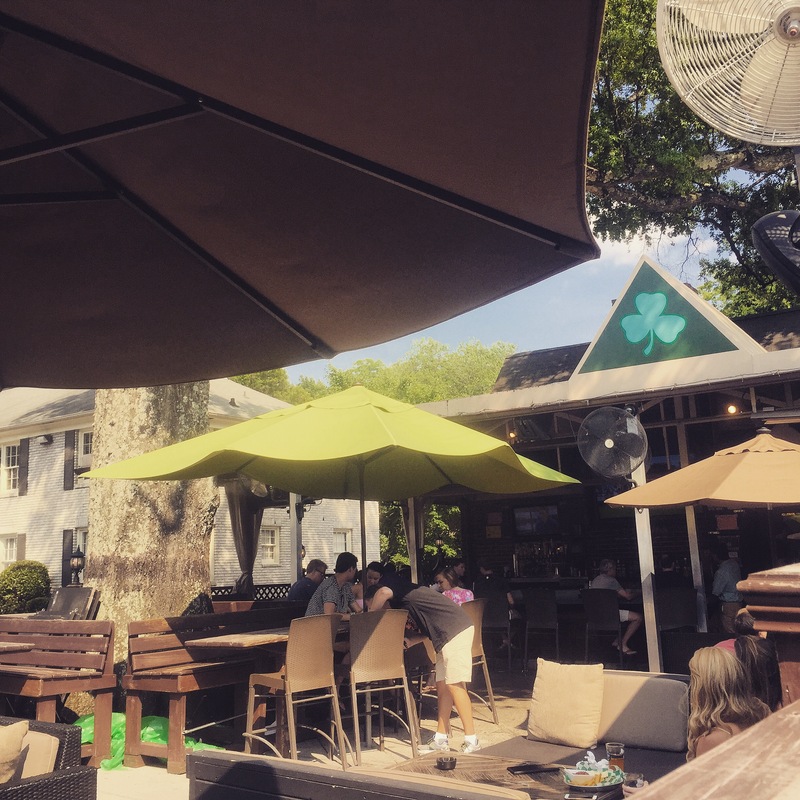 Situated under a large oak tree, the outdoor patio has large sofas and televisions that allow you to really just kick back and relax. The crowd ranges from the old man that has lived in Myers Park since he was born to the young freshly graduated college kids going out for the night. I even bring my kids there! Surprisingly, since Mellow Mushroom has gotten harder to get in and out of, we have started picking up pizza from Selwyn. It’s really good! That leads me to Reid’s. 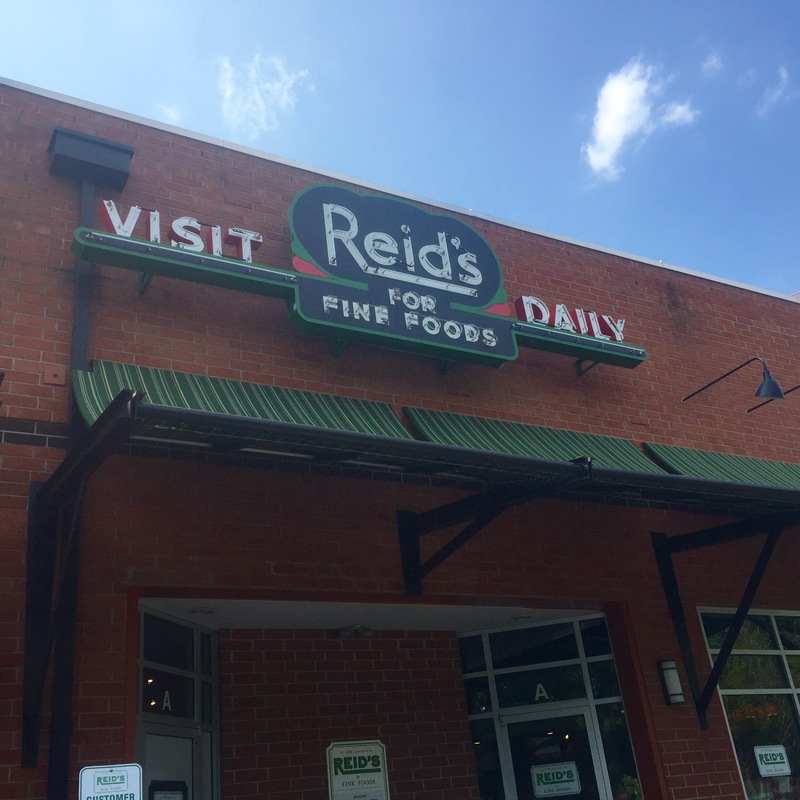 I used to go to Reid’s when it was located uptown and I resided a little less than a quarter mile away. Some things never change. I loved it then. I love it now. I will admit. It can be expensive. What do you expect? It’s fresh. It’s local. Care is put into the food. I can’t complain. I know what I am paying for. 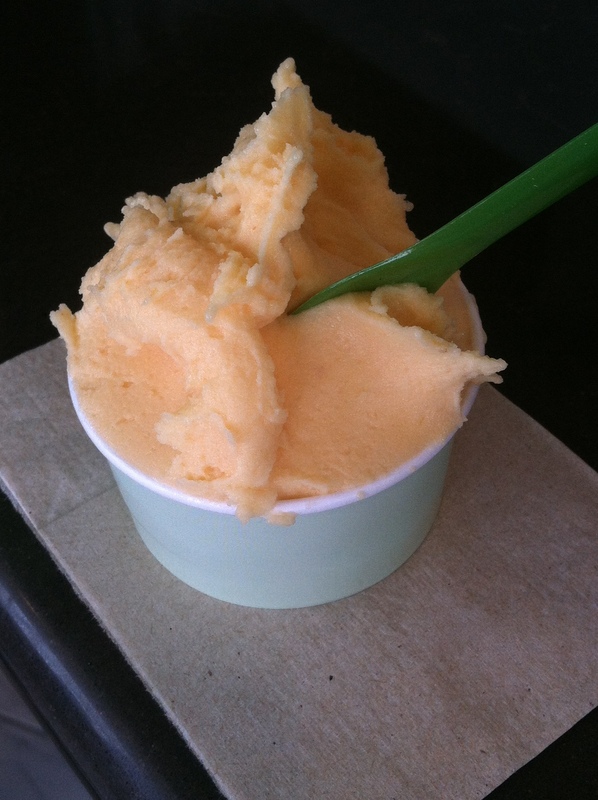 Va Da Vie Gelato – The weekend would not be complete, if we didn’t treat ourselves a little. It seems like I got ALOT of feedback about this place. 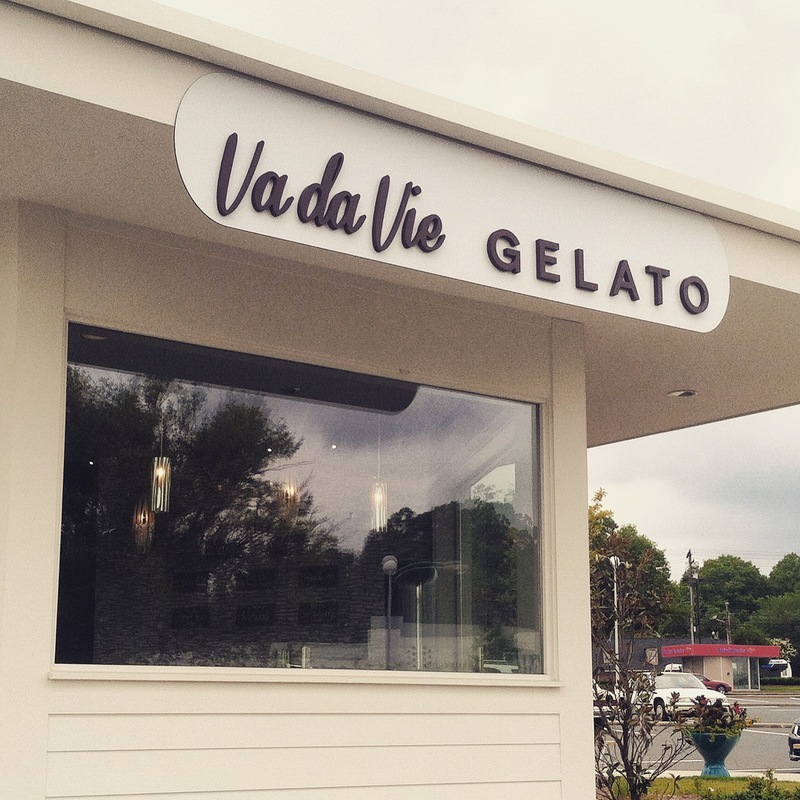 Va Da Vie opened approximately a year ago in the parking lot of Park Road Shopping Center. I really didn’t think this place was going to make it. I’m not going to lie, I am a sucker for hard ice cream. I didn’t really know what I was missing. How cute is this little building? I can’t imagine a better design for a hip, new, local hot spot. Tables surround the little building. Kids are roaming around the exterior. 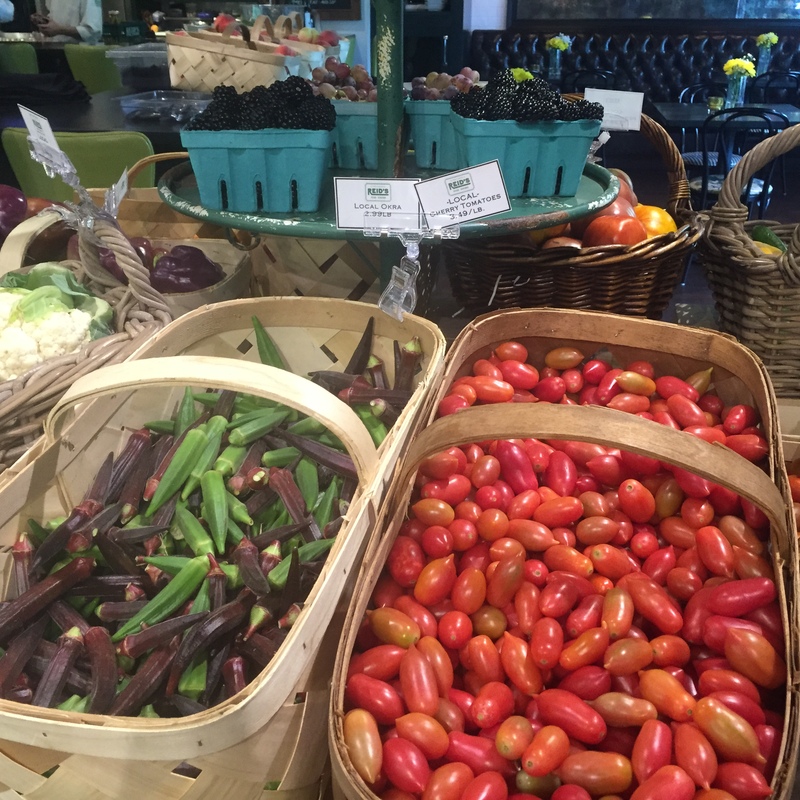 Flavors are made from locally grown fruits and can get creative. Give me some of that! So that’s that, huh? I talked a lot about food. I talked a lot about fitness. That’s what FlyJenDuf is all about. How do you balance enjoying life (and all of the good food in it), while continuing to stay fit? A typical day for us is crazy, but we have figured out a way to enjoy it while still prioritizing our health. I hope that you all enjoyed my takeover (and the stories behind it) as much as I did! 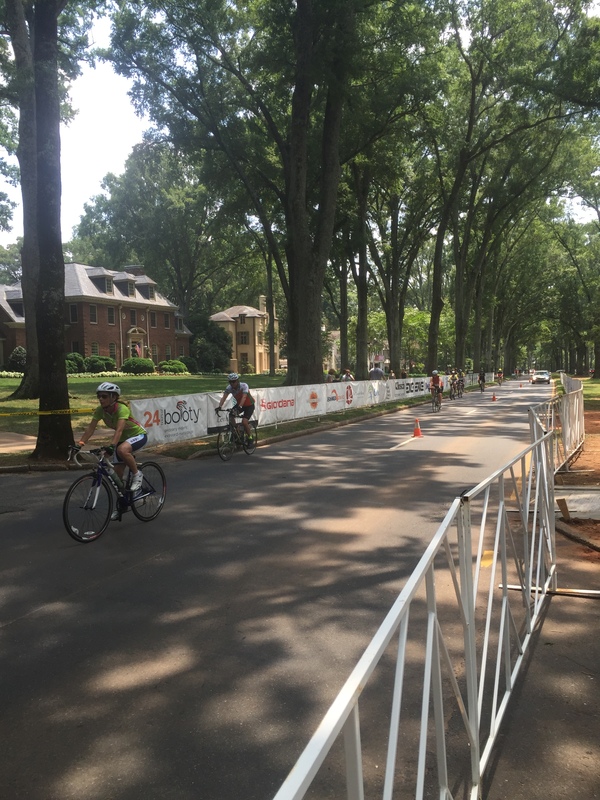 This entry was posted in food, Staying fit, workout and tagged #weloveclt, 24 Hours of Booty, F3, FiA, Flywheel Charlotte, instagram takeover, Reid's Fine Foods, Selwyn Pub, SmartCore Fitness, Tour De France ride, va da vie gelato on July 27, 2015 by flyjenduf. During a phone call with my sister-in-law this week, she jokingly asked, “I mean what would you call what you do?” She was referencing my occupation. I was kind of caught of guard and didn’t really know how to respond. I do a lot of things, and I’m not really sure that just one of those things defines me. 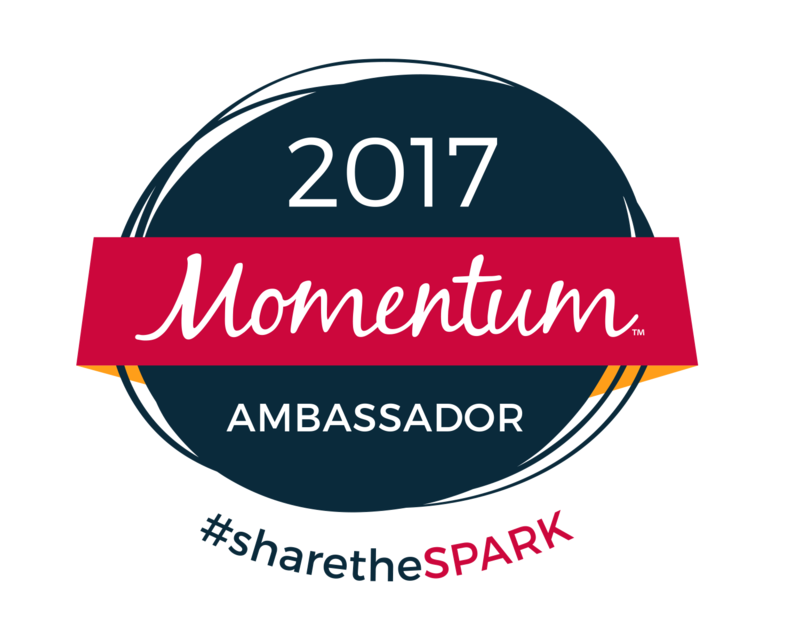 I am currently still an active CPA, now personal trainer, instructor at Flywheel, full time mom and fitness/lifestyle blogger. 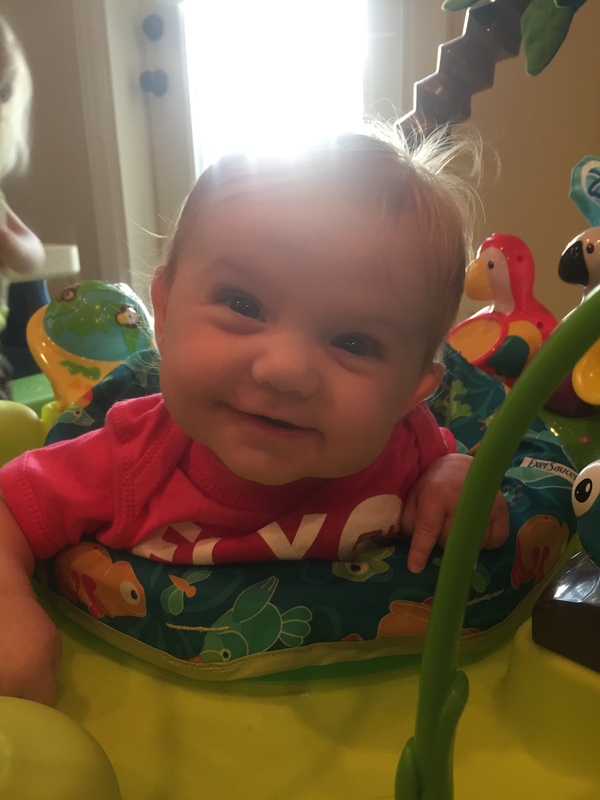 When I had my second daughter, I could never have imagined where I would be just four months out. That said, I feel so fortunate to finally be doing the things that I feel so passionate about. Nothing feels better than people telling me they do the workouts that I post on my blogs, they make my recipes and most importantly that they trust me with training them. 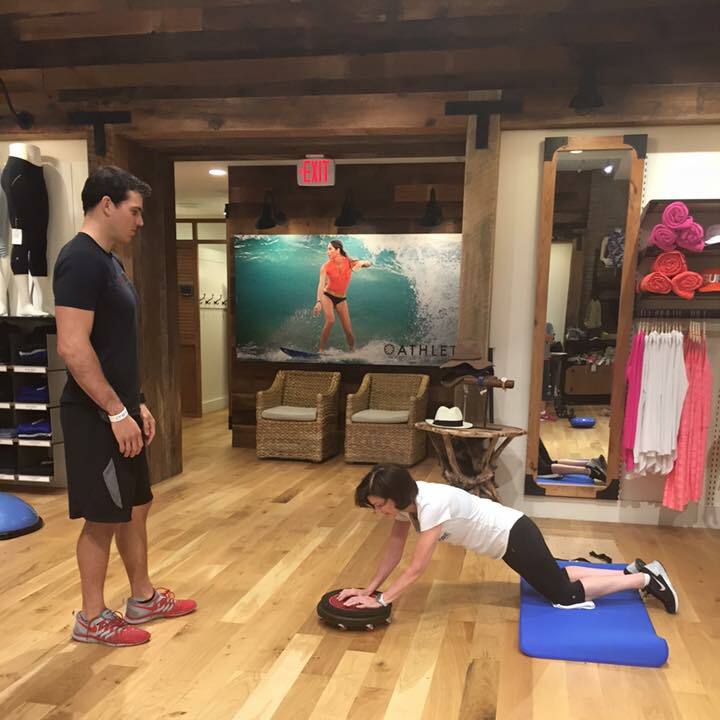 I have been teaching at Flywheel since 2012. Wow, 3 years – 2 kids. I am so glad that I have stuck with it. I truly love being on the bike as an instructor and I feel fortunate that I have met so many amazing friends and now family through such a great gym. As impersonal as sitting on a bike in the dark may seem, the friendships that have been built in that small space are incredible. 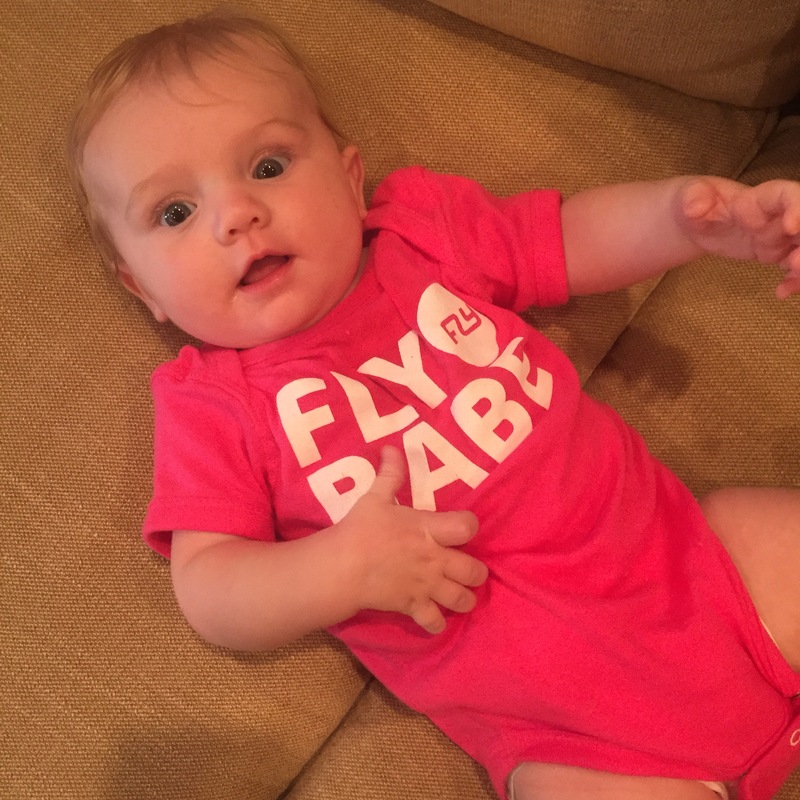 By default, my kids have joined the #FlyFam – oftentimes stopping by the studio to see me, pick me up and buy new baby apparel. This month, I joined the SmartCore team and I am now leading bootcamps every Saturday at 10 AM. This I LOVE. I embrace talking to people face to face. Hearing their issues. Helping them modify. Finding ways to help everyone just move. Sweat. Get that good sore feeling. 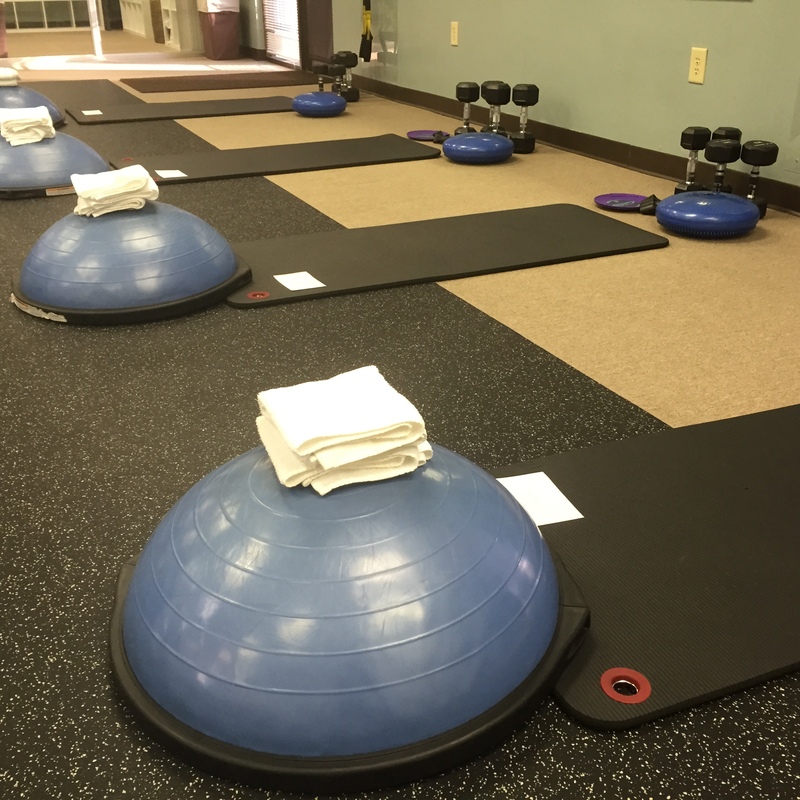 Denise Duffy and Steve Justice have built an incredible environment for working out. In just a few short weeks, I have absorbed so much information. Being around them and just exchanging ideas is literally fun. I am in a transition period truly. I can’t define myself. I am building a solid foundation to move on to the next phase of my life – fitness. Change. Motivating people to be the best version of themselves that they can be. Strong is so powerful. While I will continue my blog, I will be reaching out in other forms of social media to just get my name out there. 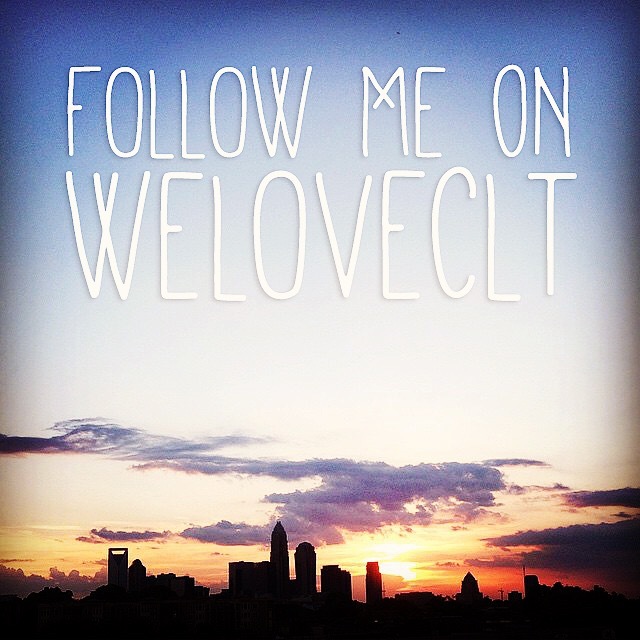 Saturday, July 25th, I will be doing an Instagram takeover of the @WeLoveCLT account. Follow me! Saturday is one of the biggest long workouts days in the city of Charlotte. It is also the conclusion of 24 Hours of Booty. I can’t wait to walk followers through all of the activity going on through my eyes on a typical Saturday. 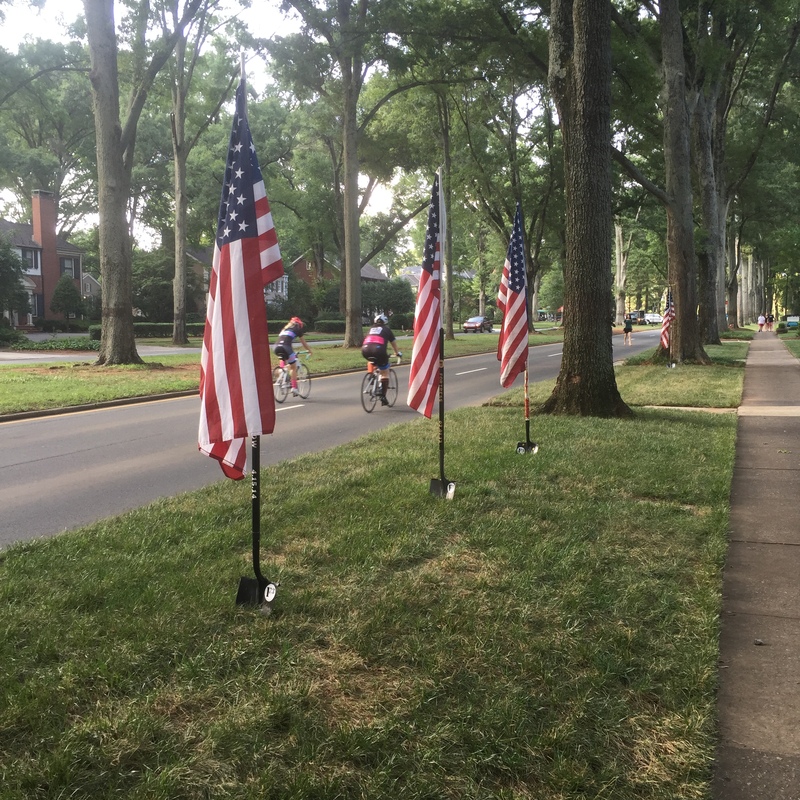 It is really incredible how active people in Charlotte are. My clients motivate me every day. I want to be the best for them every time that I teach, train or just get together with them to chat. With just a month until my Super Spartan Race, I am continuing to improvise my own workouts to meet the expectations that I have set for the obstacle race. See my week below. While it was very similar to last week, I did tweak some things. As the race gets closer, I will start to taper off and rest my body. Monday and Tuesday are my big strength days. I like to think Monday is my “brute” strength day. Heavy. Powerful. Hard. 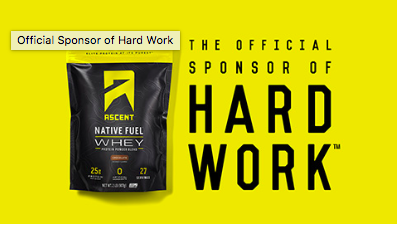 Check out the workout below. Start to finish – 51 minutes. I have said it once, I will say it again. I actually completed the bootcamp that I will be running on Saturday as my workout. Total time – 58 minutes. It says a lot about the workout if I am legitimately doing it as a key piece of my own training. I am not just throwing something together that I don’t respect enough to make it a valid piece of training for anyone. This workout is a combination of cardio, brute strength and core exercises. It hits those little muscles that you don’t hit from just doing some of the isolated exercises listed above. There is thought put in here. I am working on maximal burnout through total body movements. I already know that these exercises will make the Spartan Race seem easier. Again, I can’t just post the workout! You have to come check it out. Two solid strength days are followed up with a running day. My legs (specifically my glutes) were very sore after my Tuesday workout. I had to take the running easy. Has anyone ever told you to listen to your body? Get it. We are running here. Every half mile, we are doing an exercise. Stop – Go. It’s how that Spartan Race works. 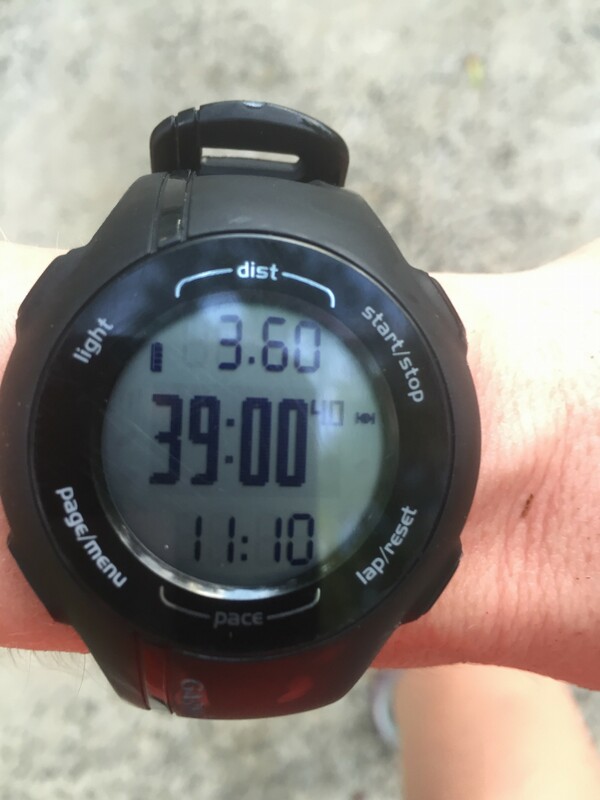 It’s how to drive your heart rate up on a seemingly normal boring run. 30 Sit Ups – Sit ups. SIT UPS. No crunches. 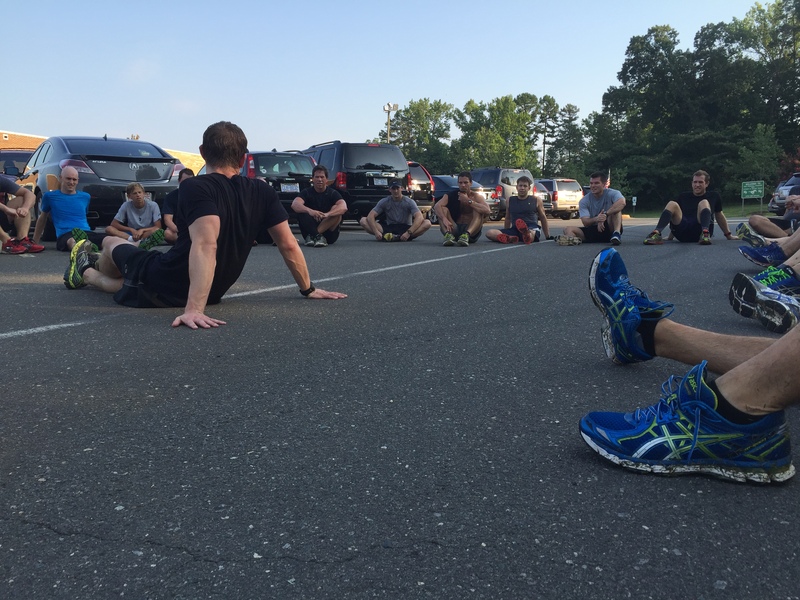 10 Burpees – Yes, I was panting after these. Repeat as many times as you need to. I clearly repeated 2.5 times. I was short on time. That’s okay. The most important part is that I got some solid mileage in and practiced that stop-go exercise. Don’t be afraid to get down and dirty. That’s what obstacle races are all about. Stop on a sidewalk, patch of grass, you name it. Don’t be afraid to get a little muddy. Rocking classes. New and old faces. Loved it. I use this day as a straight up cardio day. As I have said before, this is a great cross training workout for me. Resistance training on the bike builds my leg strength and the flats definitely work on my turnover. 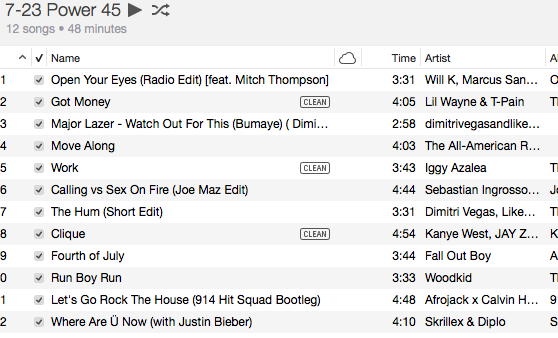 Playlist below. I didn’t intend to do anything else exercise wise on Thursday. However, when I walked out to my car prior to heading to Flywheel I noticed that I had a flat tire. Good thing I leave for class early. I was able to drop my car off and get to class on time. Phew. Later on that day, I ran to the place that my car was being worked on with my child in tow in the jogger. It’s mom strength. I hate to ask for help. Enough Said. I stayed up past my bed time Thursday. I had a hard time getting up Friday. I pushed through. Friday is typically my big cardio strength day. Let’s really focus on that Spartan Race. Stop Go exercises, sand bags, bucket carries and brute strength. Here we go. 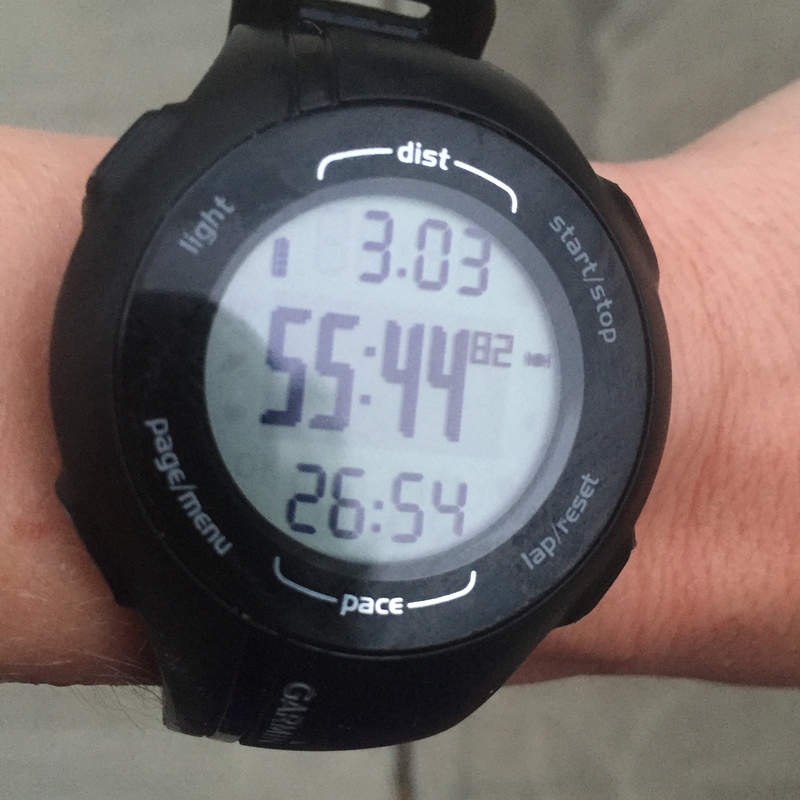 I got three miles in over fifty-five minutes. 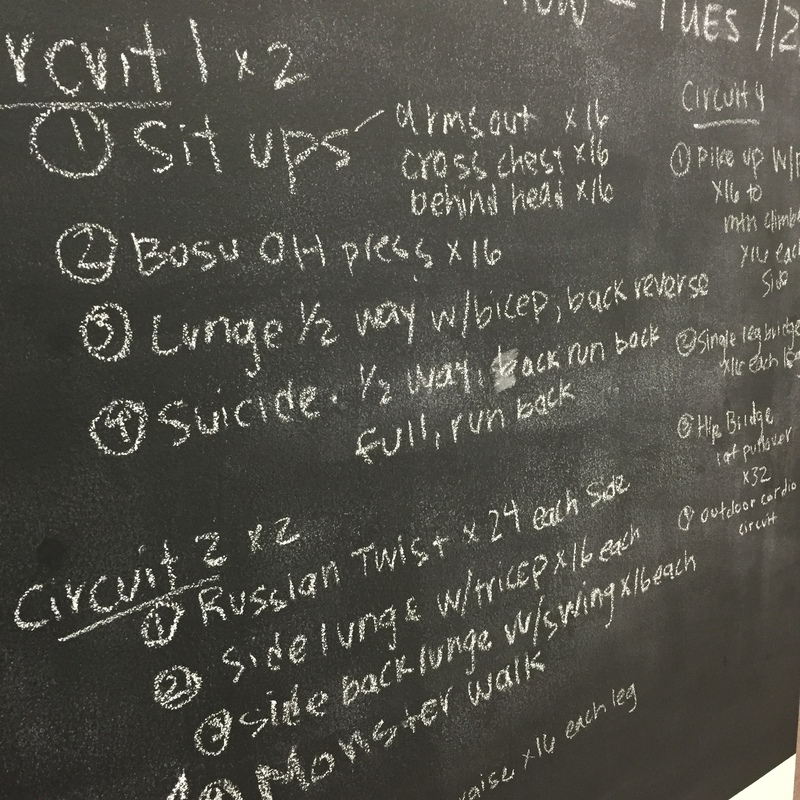 While I was feeding my daughter at 4 AM, I jotted down the workout that I would do. Hey, if I don’t go in with a plan, I usually end up just dilly dallying. Run 1 lap around block – approximately 1/2 mile. 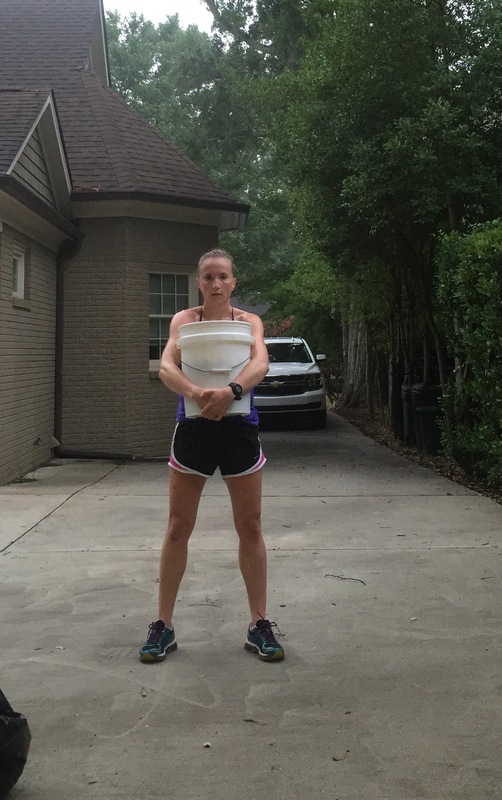 Carry bucket of rocks around the block – See picture below. It took me forever. It’s 50 pounds. It’s awkward. I had to put it down and pick it up. It was dark. There is a reason why I did this exercise first. Squat Extension with Sand Bag – see picture below. This will work your grip and strength. The bag is approximately 40 pounds. Run 1 lap around block. Walk around block with Sandbag. So hard, but this workout left me feeling super strong. Again, confident in the upcoming race. I am taking every day one day at a time. I am building a solid foundation both physically (for my race) and mentally (for my future). Fitness is my passion, and I hope that I make that apparent to each person that I interact with. 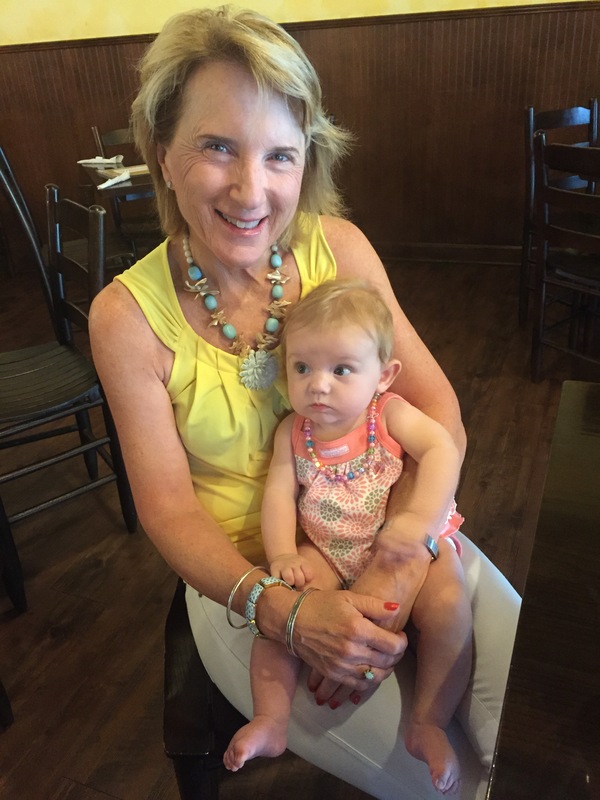 The best part about my new transition is my ability to spend more time with my children. They are growing up too fast. 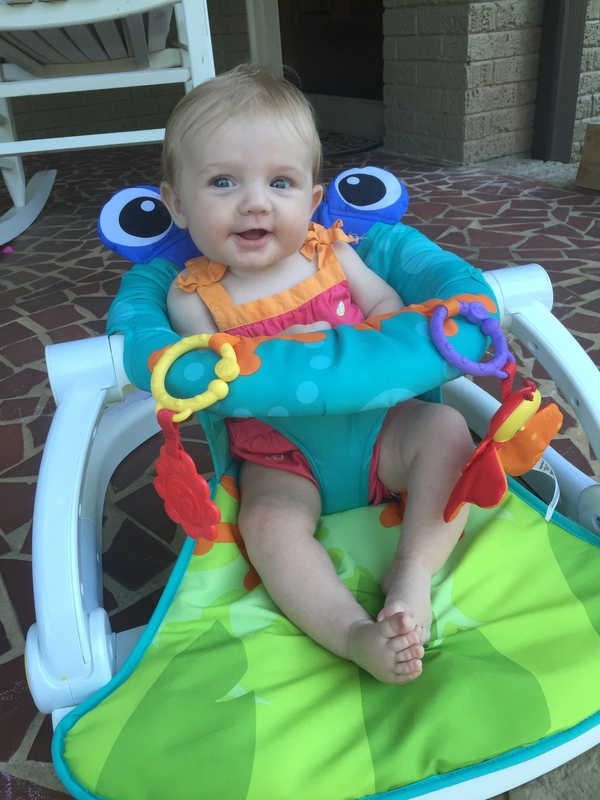 It seems like yesterday, my oldest daughter was learning to sit in a high chair. 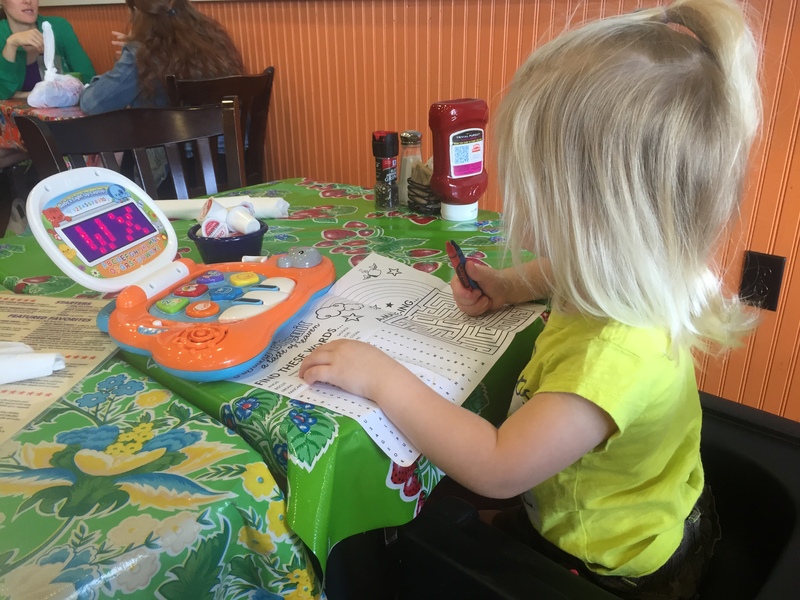 Now she is in a booster seat, working on her lap top and coloring and breakfast. Time will not slow down! 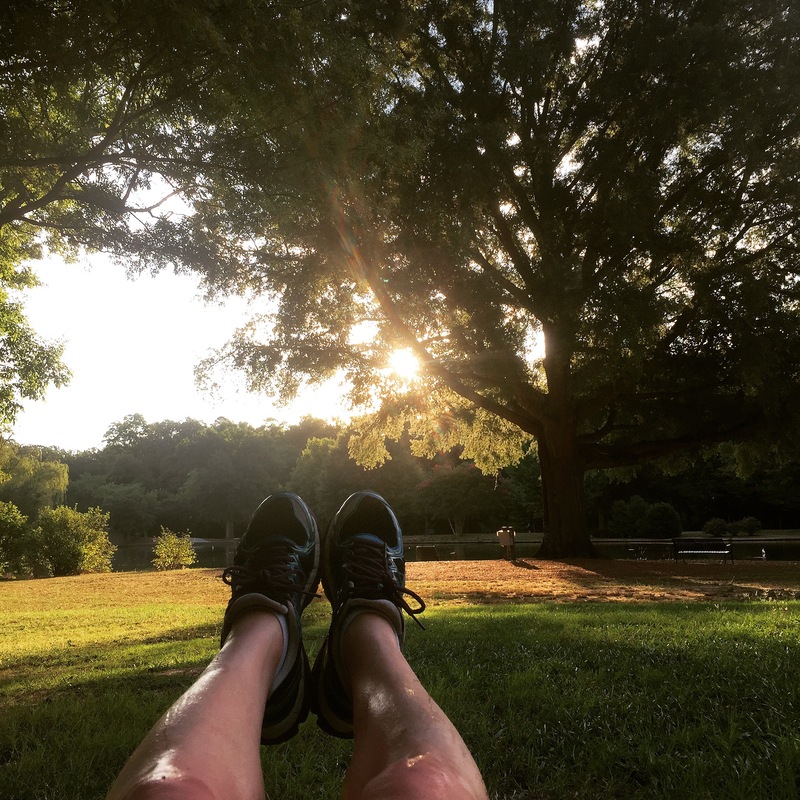 This entry was posted in running, Staying fit, workout and tagged #weloveclt, at home workouts, flywheel, playlists, running workouts, SmartCore, Spartan Race workouts, spartan training on July 24, 2015 by flyjenduf. I am so happy that I set a post-pregnancy fitness goal. People ask me how I continue to stay motivated to work out early in the morning, oftentimes by myself, in the confines of my garage. It’s all about the competition. If you are new to my blog, let me update you. 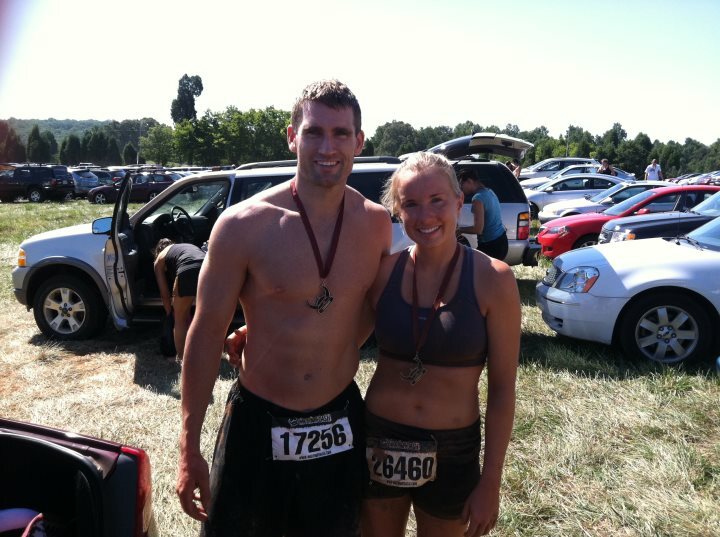 My husband invited me to compete in the Super Spartan Race in Asheville, NC at the end of August. After further discussion, he convinced me that I shouldn’t consider doing it unless I signed up for the Elite heat. So I did it. It makes me ill and nervous every time I think about it. That said, I have been training SUPER hard specifically for this race. As a result, I have shed my baby weight and feel incredibly strong and confident. I have changed my expectations. While I know this race will be difficult and my main goal is to finish, I truly think I can compete with the “elite” class. My confidence comes from a week of incredible workouts that left me feeling sore, but unstoppable. In fact, I’m so excited about the week, that I want to fill you in on how my workouts fell out and my new goals. I did ALOT of cardio the prior week and weekend. I was all set for two days in a row of strength work, starting Monday. Lucky for me, Spartan provides daily workouts for those interested. 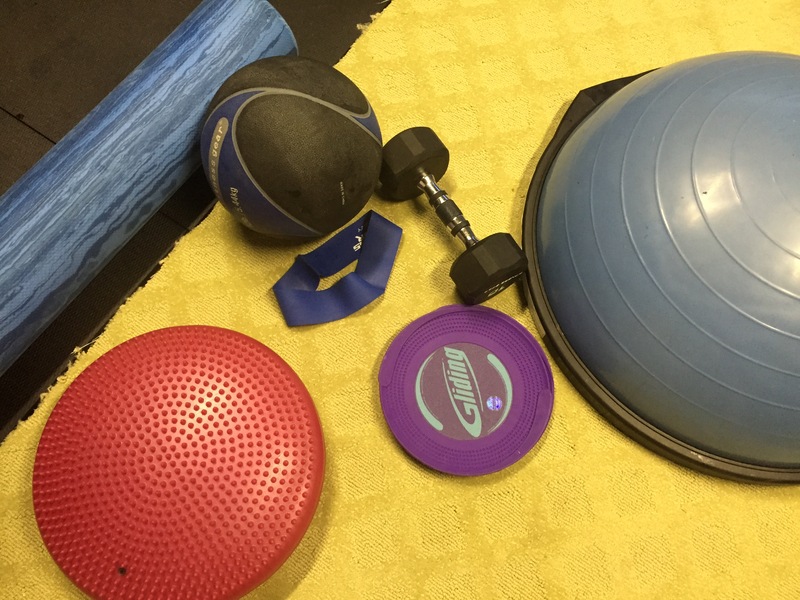 I took one of their workouts and tweaked it for a twist on a Spartan/SmartCore workout. First part, Spartan, second part, SmartCore. Part 2 – SmartCore – Now, that wouldn’t be fair if I shared with you all of my secrets. You have to come check it out! Enough said. I planned the upcoming weekend’s bootcamp. Before I sent it to Denise (the owner and mastermind of the intense workouts) for a run through, I did it by myself in my garage. Denise and I ended up tweaking a few things here and there, but all and all, I did my bootcamp (that the people who came to do bootcamp did). It took me over an hour. I was sore. All I can say is, you need to check it out. It wouldn’t be right for me to give you all of the coveted moves without you actually coming to the insane workout space to really give it a go. Just to give you an idea, I used all of the equipment shown in the picture above. It says a lot about the workout that I running other people through, when I can seriously do it myself as a legitimate piece of my training. Two days in a row of solid strength pushed me straight into a solid speed workout Wednesday morning. This workout would be great on a track, but to save time, I use a relatively flat loop around a local park that I can run to. Run 1 mile warm up – you should be sweating when you start your speed work. Part 1 – Complete each step sequentially. Transition from run to leg raises should be quick. Part 2 – Complete each step sequentially. Transition from run to mountain climbers should be quick. Repeat Part 1 and 2 sequentially 3 more times. You will run 8 400’s total. Lucky for me, I got to enjoy an incredible sunrise as I finished my last set of leg raises. Truly incredible and a perfect way to start my day. 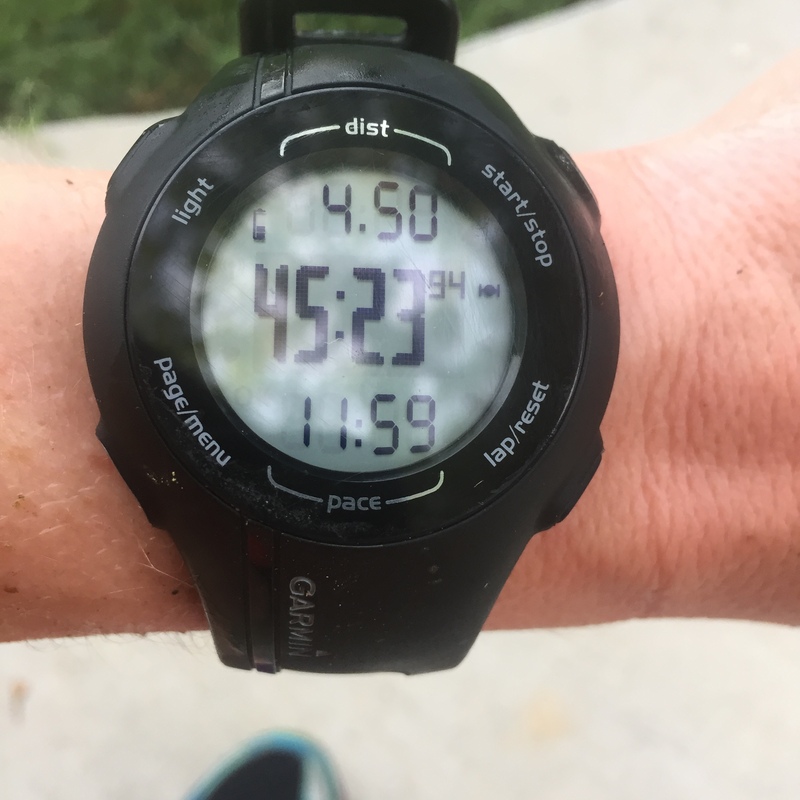 I felt strong in my runs and got in some serious mileage in just under 40 minutes. This workout could easily be done on the road or on a treadmill. Don’t use not having a track as an excuse. Enough said. I taught two classes. I ride to my class. It’s hard. It’s my workout for the day. The low impact incurred on the bike is a perfect cross training exercise for the type of training that I am doing. Flats train my speed, runs out of the saddle work on my endurance and heavy hills build strength in my legs for the mountain climbs that I will encounter in my race. See playlist below. Kind of a throwback day. The workout that changed my perspective on the entire Spartan Race. I didn’t have much of a plan going into this workout, so I surprised myself when I organized a super tough strength workout on the whim and completely crushed it. I’m still pumped about it. 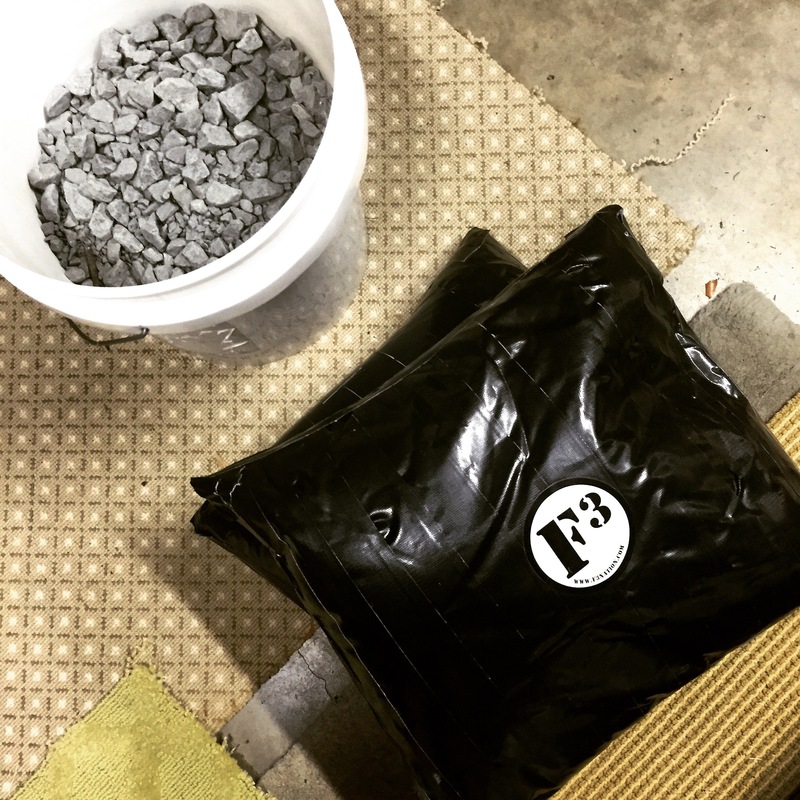 I pulled out those sandbags that my husband made me several weeks ago. Remember they weigh approximately 40 pounds each. I took the band that I have been using to help me with my pull ups and moved it out of the way. I was determined to get through this workout on my own. That I did. 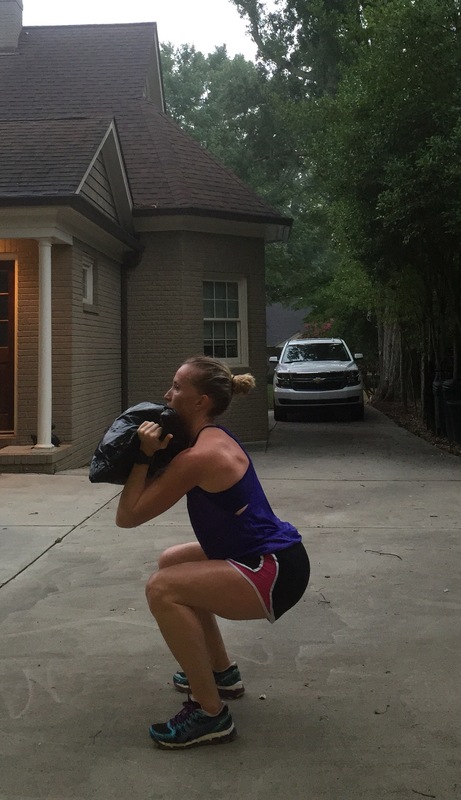 Walk 1 lap around the block holding 40 pound sandbag. Run 1 lap around the block. Now that you know the workout, here is why I feel more confident about the race. Granted, I have no clue what the course will look like (this is the first year), I have studied several of the obstacles. I walked over a mile with a 40 pound sand bag without putting it down. From what I have read, the furthest most people have to walk in the actual race is half a mile. For ladies, the bag is even lighter. At times, I had the energy to attempt to actually run with the bag. It is just too awkward to maintain. With lighter weight, I hope to be able to move more comfortably at a faster speed. I didn’t use my band when doing any of my pull ups. This is huge. I could only do one pull up after I had my second child. So, with all of this said, I’m going to set another goal for myself – a Top 25 Elite finish. I may be out of my league, but I am going to give it my best shot. Maybe I will surprise myself? 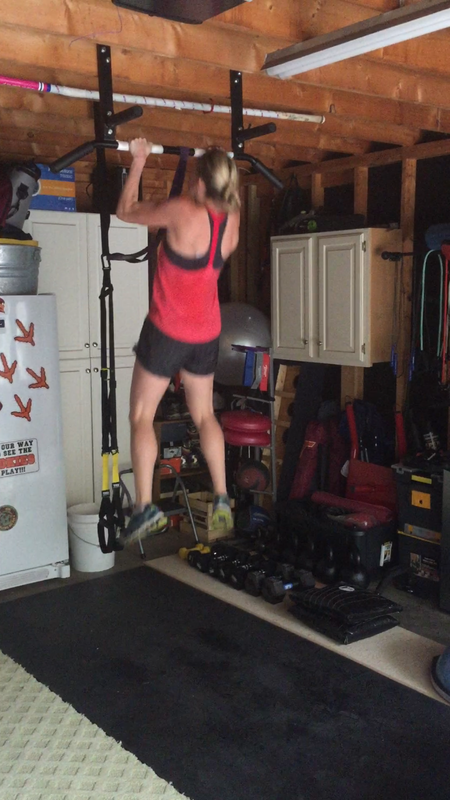 This entry was posted in running, Staying fit, workout and tagged burpee/pullup, home workout, SmartCore Fitness, spartan training, spartan workout, Super Spartan on July 19, 2015 by flyjenduf.